This felony is committed by any person who shall make any intrigue which has for its principal purpose to blemish the honor or reputation of another person. It is committed by saying to others an unattributable thing, that if it said to the person himself, slander is committed. Intriguing against honor refers to any scheme or plot designed to blemish the reputation of another by means w/c consist of some trickery. The intrigue is resorted to to blemish honor or reputation of another person. 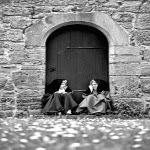 Must be committed by means of some tricky and secret plot, and not gossiping which falls under defamation. 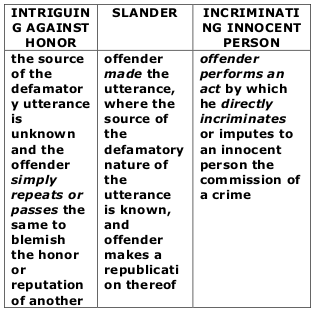 Where the source or author of derogatory information cannot be determined and defendant passes it to others, defendant’s act is one of intriguing against honor; if it came from a definite source, crime is slander. Intriguing against honor is referred to as gossiping: the offender, without ascertaining the truth of a defamatory utterance, repeats the same and pass it on to another, to the damage of the offended party. This crime is committed by any person who shall make any intrigue which has for its principal purpose to blemish the honor or reputation of another person. Go to the barangay where the crime was committed and personally file the case there. As far as I know, complaint forms are available there for you to fill up.